EWI Pro systems are built to last, offering a range of external wall solutions for improving thermal comfort and external appearance. The following are some typical external wall insulation systems using EWI Pro materials. As demonstrated, our systems are highly versatile and can be used to create numerous external wall insulation systems for a range of properties and substrates. The substrate must be clean, dry and dust free. The starter track is attached to the substrate above the DPC. This provides a level surface for the insulation to sit on; it also protects the base of the insulation against damp. Wood Fibre insulation is renowned for being extremely breathable and eco-friendly. Wood Fibre offers the building enhanced solar and acoustic protection and is ideal for improving thermal performance and allowing the building to breathe. Mechanical fixings are used as the primary method of securing the insulation to the substrate. Stainless steel wood screws with fixing discs should be used for Wood Fibre insulation. The basecoat reinforcement layer consists of the EWI-225 Premium Adhesive, which is applied directly to the substrate. The adhesive is used to create a smooth surface before rendering. Fibreglass reinforcing mesh is embedded within the basecoat adhesive to enhance the tensile strength and crack resistance of the render system. The render primer is painted onto the reinforcement layer to ensure that the render adheres to the basecoat, and to contribute towards a durable render finish. EWI Pro offer a range of coloured renders, all of which can enhance the external appearance of the property. Each render provides a long-lasting, crack-proof finish and come with a range of advantages for the building structure. We recommend choosing a breathable render for use with Wood Fibre insulation. 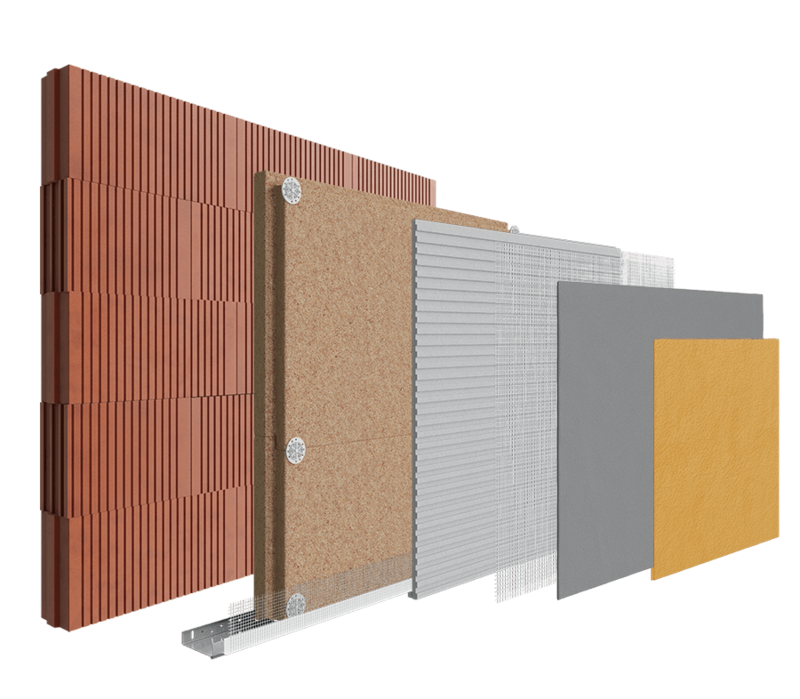 EWI Pro’s most sustainable insulating material, the Wood Fibre insulation system offers porotherm brick substrates breathability and improved thermal performance. Wood Fibre is ideal for use on breathable Porotherm bricks as it is a vapour-open material; thereby complementing and working in harmony with the substrate as opposed to hindering its performance. The system is then finished with a breathable thin coat render, such as the EWI-075 Silicone Render, to achieve an aesthetically pleasing finish.